Chronicling the major turning points in Susan Kapatoes’ life, A Spiritual Journey brings readers into her deeply personal yet entirely accessible experience of the divine. In beautifully compelling prose and poetry, she describes the transformational moments that deeply touched her heart, showing her that existence extends far beyond the boundaries of the physical world. Susan shares heartfelt stories of love, spirituality, friendship, and difficulty along with moments of the sacred and the miraculous. Readers who have journeyed along with her have undergone an expansion of consciousness and a glimpse of the greater reality. In clear, simple, and elegant language, A Spiritual Journey empowers each of us to take positive action and awaken our own inherent wisdom. Susan shares invaluable tools for igniting our own spiritual journey, tools we may not realize we have access to. She helps us reconnect with the spiritual intelligence within, taking us far beyond Mindfulness and ordinary Meditation. A Spiritual Journey has garnered wide acclaim and is on its way to becoming a bestseller. Reconnect with your divine essence and read it today! 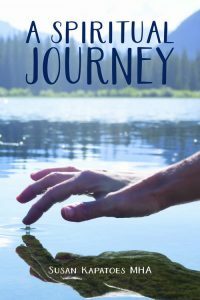 “I found the stories very honestly written, and humored too, to make the journey more real and meaningful, touches on the real meaning of life, and how we interact with people on our daily adventures.